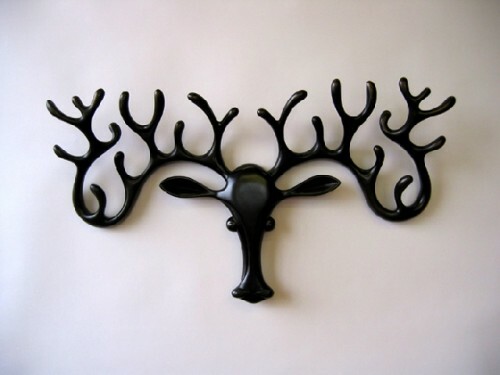 Hang your hat on Judy Kensley McKie's "Moose Rack" images courtesy of the artist and Gallery Naga. A creepy crawly "Spider Table." 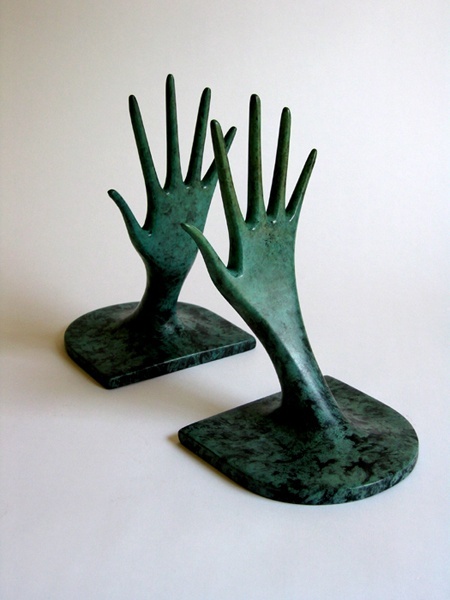 An editioned "Helping Hands" in bronze. This past June, the Furniture Society of America presented Judy Kensley McKie with an award for lifetime achievement. This recognition is a rare achievement. Few artists can be considered masters in their own lifetimes. Without much debate, Judy McKie is certainly one of them. She is an American Master, no a World Master artist. And though steeped in the precedents of traditional master craftspeople, Judy McKie is contemporary artist in every aspect of her work. Yet, her work resonates like any other great pieces of art. The work has a quality beyond the purely visual, beyond the imagery and content, beyond the fine materials and even beyond the extraordinary craftsmanship and artistic touch. The sum is greater than whole. It is magical. A case in point is a wonderful carved "Dragon" stool on exhibit at the venerable Peabody Essex Museum in Salem, Massachusetts. Exquisitely carved out of Indiana limestone, it is creatively based upon an 16th Century carved stone Chinese drum stool from the Peabody's permanent collection. The Peabody Essex Museum exhibit, Inspired by China, is a group show of 21 contemporary studio furniture artists from the US, Canada and China who were asked to create new pieces based upon works in the museum's collection. The exhibit is entitled and will travel around North America. Each artist is recognized as a leading practitioner in the field of studio furniture art. Over a three-day workshop at the Peabody Essex Museum in June 2005, the artists viewed the historic pieces for the first time, delving firsthand into the forms, materials, and techniques of China's rich and varied furniture traditions. Each artist then returned to their studio to make something new inspired by their experience. Judy McKie's contemporary piece "Stool" is certainly as beautifully crafted as the museum reference piece. The two stools are at once similar yet different. Both have a timeless quality though created five or six hundred years apart. Mystical as well as functional, each of the stools was created by a very special artist. Part of a series that were fashioned from an original and digitized drawings that were then used to machine carve and later be hand-finished, there is also a Dragon drum stool/table now part of her breathtaking exhibit at Boston's Gallery Naga. In a catalogue for the Inspired by China exhibition, Ms. McKie wrote that she was highly impressed with the complexity and intricacy of the Chinese design and how the artists did not distract from the overall design and beauty of the curves and proportions of the furniture. What surprised her was how often with very simple forms, even though they had decoration on them, the decoration tends to blend into the form,. In other words, you see the forms first. Her love of carving in relief and in the round influenced her decision to make a small stool/side table. What is most wonderful about McKie's work is that every piece that she creates is a stand alone sculptural object. Animal images are a major aspect of her broad visual vocabulary. However, these are not representations of clearly naturalistic animals, but creatures with spirit, creatures with movement and creatures with a natural yet abstract quality. Each of her functional objects is a formal sculpture as well. Somehow they all convey an extraordinary sense of both hard and soft, serious and playful while being somehow simple but exceedingly often complexly enriched. A sense of whimsy permeates all her pieces. This whimsy is intertwined with form and function that is at once energetic and always graceful. Over the past decade or so, I have been an art critic Boswell to her visually evocative Samuel Johnson chronicling her work as well as I could from the point of view as a true fan. I have written on her work since the mid-1990's for various publications and each time, I am left in awe and wonder by the quality and gracefulness of each of Judy McKie's works of art. The most recent extraordinary exhibition at Gallery Naga is no exception to this rule. The exhibit is made up of small, medium and large objects. As they are all functional, the pieces are human-scaled. Judy likes a challenge, so she tries to do new functional objects to keep fresh. Also, over the years, McKie has vastly expanded the materials pallet that she works in. The pieces here illustrate this as well. 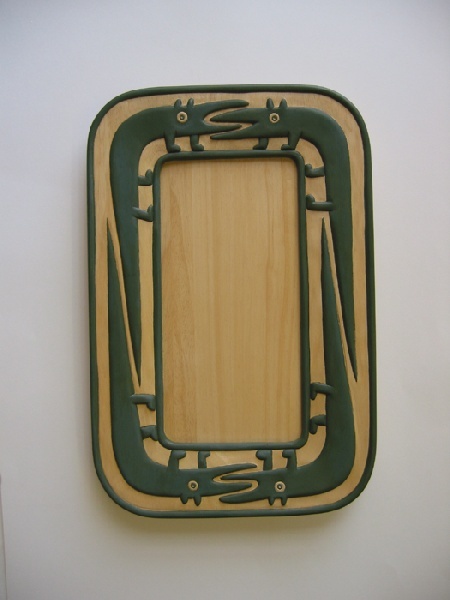 Rather than one-offs with carved wood, this allows Judy to develop editions of work. A pair of hands that forms "Helping Hands Bookends" (2006) is created in an edition of 32. 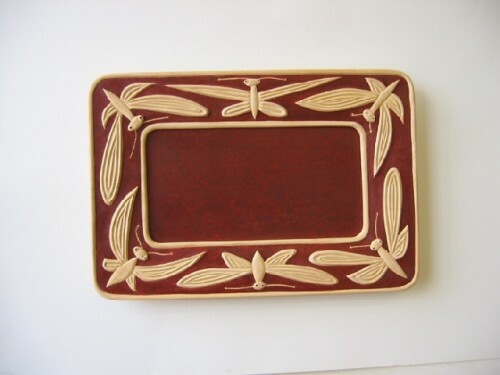 Eight elegant one off trays were created from carved and painted Obeche, an African tree wood. Each of these has a specific animal design theme-geckos, fish, birds, butterflies, etc., and were sold before the exhibit opened from being viewed in the also elegant catalogue produced by the gallery. This underscores the pent up demand for her work. Much of the work in the exhibit has been sold. This goes for the one-off pieces as well as works in editions. Some of the larger works in the show are literally show-stoppers. 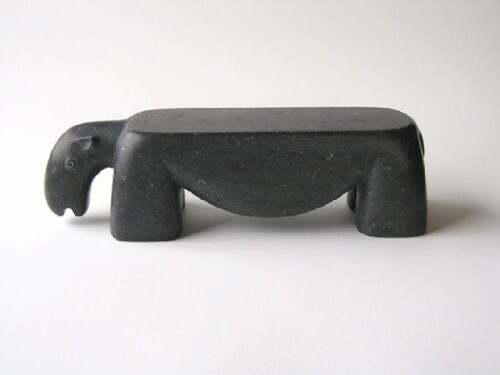 A maquette for ÃƒÂ¢Ã‚Â€Ã‚Âœ Hippo Bench' understates the power and whimsy of the actual carved black marble finished piece. A very graphic full scale drawing is pinned to the gallery wall. 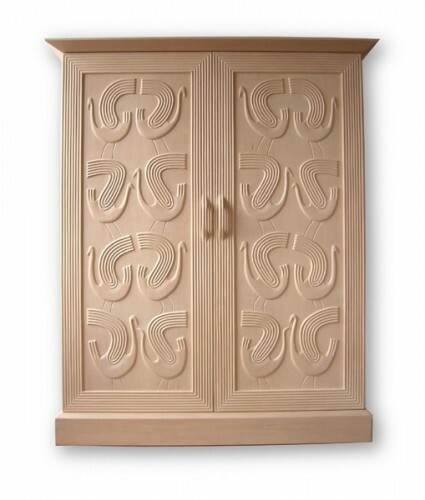 A highly refined carved limewood large "Swan Cabinet" (2006) defines a back wall of the gallery and may be a metaphor for McKie's own graceful and sublime talent. 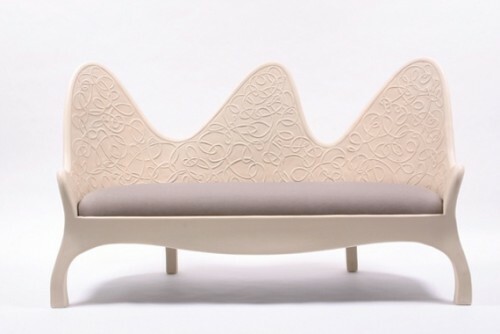 An "Ivory Bench" (2003) fabricated out of cast epoxy resin and mohair stuffed pad is an ottoman that would fit the former Ottoman Empire. The four cast bronze pieces include a "Bird Settee" (2005), the "Wagging Dog Chair" (2006), the "Dog and Cat Chair" (2006) and the "Moose Rack: hat rack (2006), and all are fabricated in varying editions. 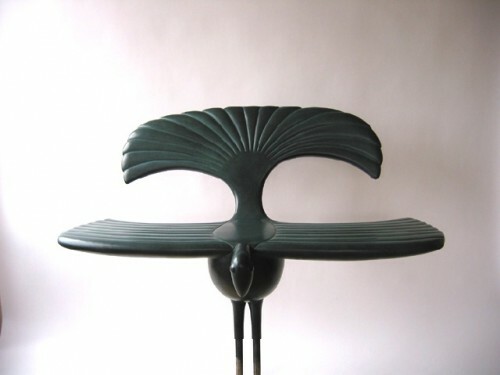 The "Bird" is simply soaring, a masterpiece throne fit for royalty. 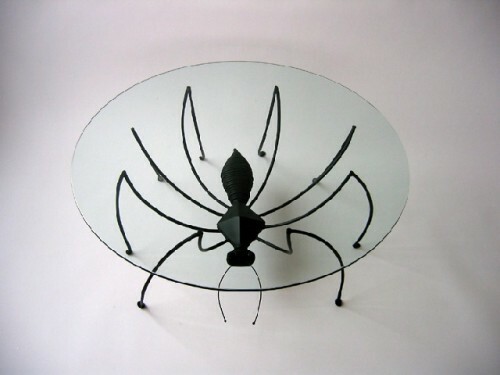 The steel and glass "Spider Table" (2006) has a creepy crawly aspect to it. 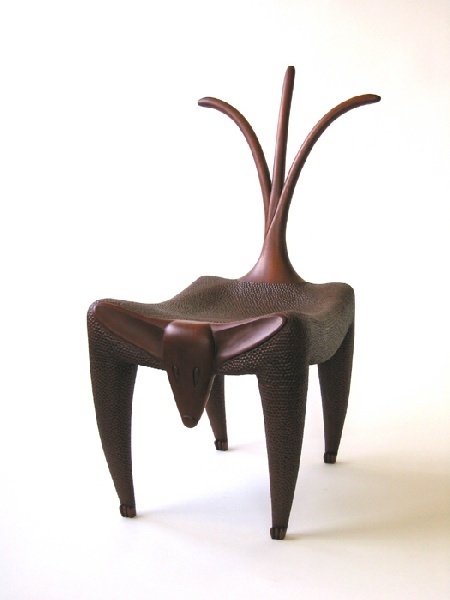 The carved mahogany "Wagging Dog Chair" (2006) was created in an edition of two. 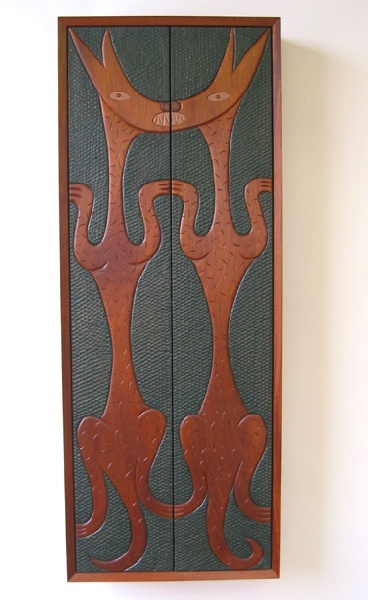 The wall-hung striking almost medieval "Dancing Wolves Cabinet" (2005) is made from carved and painted mahogany. It is beautiful both inside and out. And, of course, the previously mentioned "Dragon Stool/Table" (2006) carved out of Indiana limestone stands out as an outstanding contemporary relief sculpture on a low rise furniture element. A few wags have leveled criticism of her work in that it could be considered as somehow derivative of historic and/or ethnographic forms. On the contrary, these derivations are no more reference based than any other major artist's work. They are thematic and contextural without being totally derivative. They are interpretive as opposed to conceptually or content borrowed. This is like saying Paul Gauguin's work is too derivative of the Tahitian people and personal mythology and metaphor that he based his major paintings on. McKie, too, has a personal metaphor and mythology where animal forms become abstracted yet recognizable, anthropomorphic yet strangely primeval. 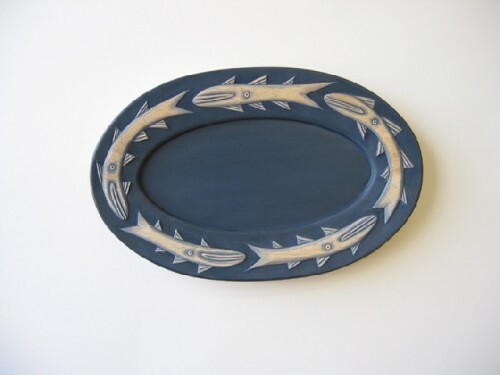 Several years ago, I wrote that Judy McKie's prolific gifts are evident not only in her sensitive decorative details, but also in the basic form of her pieces. This is as true today as a decade ago-perhaps, even more so. She is able to reach beyond the functionally beautiful to the spiritually joyous, from pure craft to something truly artistic, and from the clearly objective to the aesthetically profound. Judy McKie's work needs to be viewed, experienced. It is an aesthetic occurrence that is rare. Perhaps, it has something to do with both truth and beauty. Mark Favermann is a sports and urban designer whose clients have included the U.S. Olympic Games, the Commonwealth Games, the Boston Red Sox and numerous American cities. For many years he wrote the Design column for Art New England. "Hi-- we have a wonderful piece of Mckie's coming up for auction in our October sale. I was thinking that our audience would be interested in your article and wondered if I could ad a link to the article in the description of the table Thanks Nick Thorn Vice President, Modern Art & Design Litchfield County Auctions"